Over the past four years, The Drab Doo Riffs have captivated gig-going audiences throughout the country. Their love of ’60s surf and garage rock has also seen them latch onto sci-fi imagery and create their own world of retro-futurism through their album art, posters, and music videos. But the band’s music has also sought to throw off the shackles of genre-expectation and now eeks out its own distinct corner of the auditory universe. Gareth Shute caught up with singer Karl Steven (of Supergroove fame) and M.F. Joyce (formerly of too many bands to mention here) to discuss the new musical world that the band are trying to create. It’s a Friday night in June and a long queue has formed outside Auckland venue, Galatos, and by 10pm it’s announced that door sales have sold out. The event is the EP release party for ‘Aquatic Ape Theory’ by The Drab Doo Riffs and by keeping the door price at a low $10, the band have inadvertently begun having to turn punters away. Word has gotten around that The Drab Doo Riffs are the killing-most band on the local scene and it’s almost overkill that tonight they’ve enlisted some classic local acts as their supports – a reformed version of The Hallelujah Picassos, Wellington freak band Orchestra of Spheres, and David Saunders from The 3Ds, backed by Street Chant. The Drab Doo Riffs have earned their devoted audience through a mix of canny promotional efforts and regular gigging throughout the country. ‘Aquatic Ape Theory’ is the band’s fourth EP. 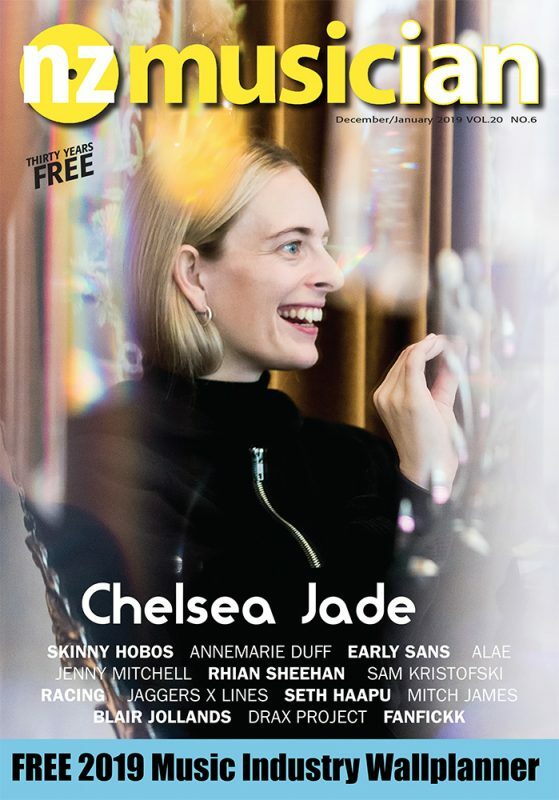 Unlike many Auckland bands, they’ve made the effort to reach out into the small towns of NZ, for a time leading up to its recording, they were averaging two shows a week within Auckland itself. On recent forays to Australia the band have packed in a solid couple of weeks of touring, playing every night of the week, sometimes twice. This schedule of touring has had the effect of making the band into a formidable live force and this carries across to the punchy sound of their latest EP. The band’s guitarist, Lucy Stewart, had only just moved from acoustic to electric guitar as her main instrument when the group started, but now she drives their sound with heavy single-string strumming and swooping, heavily-reverbed riffs. The rhythm section of bassist Marcus Francis (M.F.) Joyce and drummer Mikey Sperring have kept the wild attitude of their early recordings, but given them a more taut structure while, up the front, Karl Steven is back to his full charismatic power as a singer, and is ably teamed with co-lead-singer, Caoimhe Macfehin. Steven has revelled in the chance to get back on the live stage after a self-imposed exile from music, following the painful demise of his former group, Supergroove. Taking The Drab Doo Riffs in the direction of surf guitar music has put the band in a lineage of great local acts that reaches from ’60s surf-psych act, Music Convention, to Flying Nun favourite, King Loser, to modern groups that Steven admits an affection for, including Los Hories and The Don Kings. However, he is wary of drawing too much inspiration from his compatriots. In this respect, says Steven, the band learnt as much from touring the country with Liam Finn as they did from playing with bands more closely related to their own sound. It was the attitude towards making music come alive onstage which was important, rather than any stylistic element. He finds his songwriting is also stirred by his DJing slots on bFM each Friday night, Dr. Karl‘s Midnight Hour. More recognisable is the influence of old sci-fi movies and novels from the 1950s and ’60s, though retro-romanticism is not the only thing driving this academic artist’s interest. “Back in the mid 1900s, space travel was an inspiring new possibility that created a fad for applying broader philosophical and scientific ideas – more ‘cosmic’ ideas – to everyday life. Not just in universities but in trashy books and drive-in movie theatres. I think that the situation that we’re in as humans, being animals alive for a span on a planet in the universe, is completely extreme and insane and amazing. A fascination with pulp sci-fi has also consistently been reflected in the group’s cover art, posters, and music videos, imagery created by bassist, M.F. Joyce. The development of his drawing talents reach back to his childhood when he was inspired by the sketching ability of his older brother, Sean. The two brothers toyed with creating cartoon flip-books – drawing successive images on each page, so that when you flipped through them, the images would be put in motion. However, during his teen years at Selwyn High School, music took over as Joyce’s first love, and by 15 he was playing shows in bars. “It wasn’t unusual at my high school for young guys in their early teens to be doing that sort of thing. All the Supergroove guys had been there before me and there was a really strong music department. The music teacher, Trevor Thwaites, was very supportive and so was Katherine Mulligan who followed him. After high school, Joyce moved on to play in fuzz rocker band The Demi Whores, and began doing the band’s gig posters, then eventually an album cover. He also went on to play in alt-country group Boxcar Guitars, and in garage rock act Bloody Souls. The strength of his gig posters let to him being asked to do comic strips for The Fix, and later Real Groove magazine. However, Joyce’s most high profile work was the cover he did for the vinyl release of Bachelorette’s ‘End Of Things’ EP, which came out through legendary US indie label, Drag City. It was a fait accompli that Joyce would also do the artwork for the Drab Doo Riffs and his images helped solidify the concepts around each of their early EPs – for example, the spaghetti western theme of ‘Fistful of Doo-Riffs’, or the surf noir theme of ‘Postcards From Uranus’. His images have become a signature of the band and they are tied together across the different themes by Joyce’s own distinct approach to drawing: ‘It’s heavily influenced by old print-making techniques, like etching and zinc plate etching. I’ve always been into all that old William Blake stuff. But unless you have a printing press at your disposal, it’s quite hard, so instead I achieve a similar aesthetic through intensive repetition. Having done a short animation course after high school he was also able to turn these images into stunning animated music videos, working alongside experienced editor, Chris Stapp (who’d previously done an animated video for his own group, Deja Voodoo). 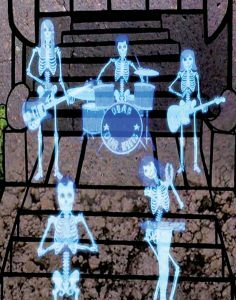 The Drab Doo Riff’s song, I Wanna Be Spock, led to the Vulcan becoming a recurring character in their videos, while the band themselves were replaced by skeletons. Joyce’s latest promo video for ‘Aquatic Ape Theory’ is a remarkable spectacle and sets a new benchmark for the group, as does the production on the EP itself. On this occasion, the band moved away from home recording and used an NZ On Air grant to help fund session time at York St and Montage Studios, which more usually does television audio work. The band produced the EP themselves, though also employed Tom Anderson as recording engineer and Simon Gooding as overdub, mix, and mastering engineer. Steven is currently working as a freelance music producer and has his own studio at his house in Thames, where he regularly does soundtrack work. The music to the TV series Harry and The Blue Rose have been his. Currently he‘s making a radio documentary on the different instruments within an orchestra. His experience in music production reaches back to his teen years – he mastered Shihad’s first album, when he was only a few years out of high school. He used his knowledge to create a gritty sound for this latest EP. The bass guitar was put through two separate amps – a Fender Bassman tube amp and a small Roland Cube guitar/keyboard amp. The resulting sound was deep, but had a thwacky tone overriding each hit of the strings, adding its own rhythm to the sound. Stewart went for a more classic sound on the guitar tracks by sticking with just her Fender Blues Junior amp and occasionally hotting it up with a Big Muff guitar pedal. While in the past, the band have dabbled with having other instruments on their tracks (trumpet, organ, etc), this time these were seen as superfluous and Steven even put aside his own instrument, the harmonica.